Gonzaga remained at No. 1 after extending the nation’s longest winning streak to 20 games. Virginia stayed at No. 2 after winning both its games last week. The Bulldogs received 42 of 64 votes in the men’s college basketball poll released Monday after finishing an undefeated run through the West Coast Conference. The Cavaliers had 21 first-place votes and No. 4 Duke, which fell a spot, had the remaining one. 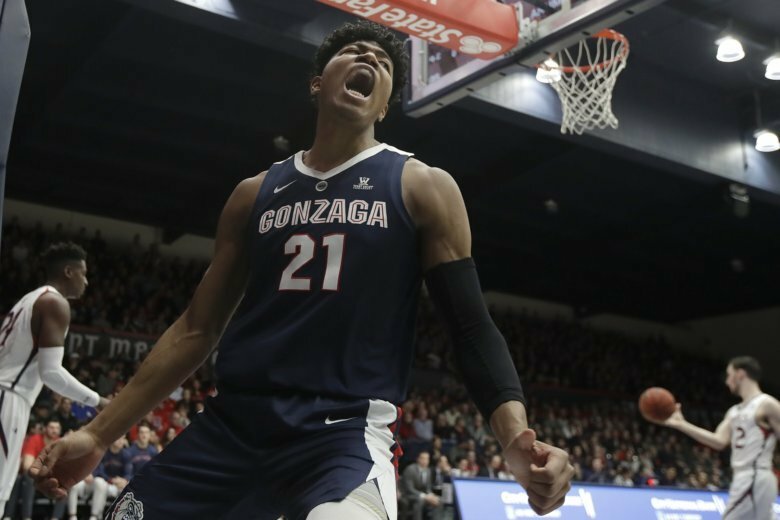 Gonzaga (29-2) capped off a 16-0 run through the West Coast Conference by rolling over Pacific and Saint Mary’s to earn the No. 1 seed in this week’s WCC Tournament. The Zags set a conference record by winning by an average of 27 points and could be looking at the No. 1 overall seed in the NCAA Tournament with a seventh straight WCC Tournament title. Tennessee was No. 1 in the AP poll and a No. 1 seed in the NCAA selection committee’s initial rankings before losing to then-No. 5 Kentucky and No. 13 LSU. The Vols could be headed back to the No. 1 line after beating Ole Miss and blowing out Kentucky in a rematch last week. Central Florida had been on the NCAA Tournament bubble needing a big victory to push over the top. The Knights got it on Saturday, handing No. 12 Houston its second loss of the season while ending the nation’s longest home winning streak at 33 games.